The Yorkshire Terrier, or Yorkie, gets its name from Yorkshire, England where the breed originated. Abby (meaning joy of the father), Drew (meaning manly), and Haven (meaning safe place) are a few name selections of English origin. Yorkies were bred for use in cotton mills. Names related to cotton products include Terry (terrycloth), Cambric, Twill, and Socks. Famous names in cotton borrowed from the Industrial Revolution include Whitney, Lewis, and Wyatt. Eli Whitney is famous for the invention of the cotton gin. Lewis Paul and John Wyatt are known for the creating the flyer-and-bobbin system as well as the roller spinning machine. 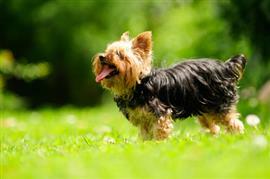 The original purpose of the Yorkshire Terrier was to get rid of mice and rats that were taking over the cotton mills. A few popular names taken from fictional mice are Mickey, Mighty, Jerry, and Minnie. Rube is an interesting selection borrowed from Rube Goldberg known for creating complex machines to accomplish a simple task. The game mousetrap is an example of one such machine. Millions of people around the world use a mouse each day to interact with their computers. Bart is a good name idea derived from Douglas Engelbart, the man that invented the mouse. Some of our pages will contain a subcategory. A subcategory is a slightly more specific grouping than the main topic of the page. For a subcategory, we will include a separated table of names and corresponding descriptions. An example of a subcategory of Red Dog Names would be 'Dog Names Inspired by Red Wines'. If you have any subcategory ideas for the Yorkshire Terrier Names page, we would love to hear them. Use the form below to submit your ideas.